Innovation is thriving at the Minnesota Department of Transportation, thanks to a program called Destination Innovation. Launched in December 2009, the program is patterned after Highways for LIFE. Destination Innovation’spurpose is to transform the Minnesota DOT’sculture, process, technology and way of thinking to invite innovation and rapid adoption of new practices. Employees are encouraged to submit innovative project ideas for funding approval by Minnesota DOT management. Deliver innovative technologies, processes, financing, practices and performance measures that illustrate significant improvements in safety, quality and cost efficiency. Lead to rapid change to accelerated construction of high-quality, cost-effective and enduring projects. Ensure incorporation of a wide variety of innovations and project types. Ensure agency-wide distribution of Destination Innovation funding. The goal is to have at least one project per district. Be marketable, promote the agency’s transportation program and add value its customers. "This program really resonates with me personally because of my involvement with Highways for LIFE," said Minnesota DOT Commissioner Thomas K. Sorel. When he was the Minnesota Division administrator for the Federal Highway Administration, Sorel sat on some of the selection panels for Highways for LIFE demonstration projects, which incorporate innovation with the help of FHWA grants. "I saw that program as something that worked very well at the national level. Then in this position at MnDOT, I went to one of our division directors and asked him to do some research and figure out how we could apply it," he said. 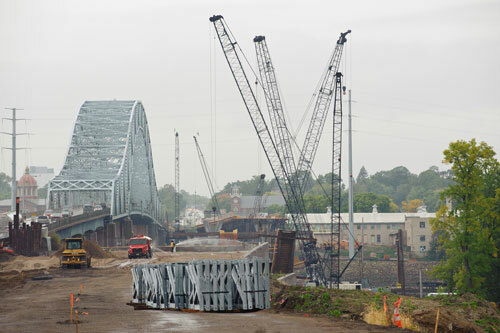 Destination Innovation funds helped the Minnesota DOT develop a plan to deliver a complex bridge project in Hastings on an accelerated schedule. Through some state legislative activity, the Minnesota DOT found itself with $30 million in undesignated funds and decided to put the money to work in the Destination Innovation program. The idea faced initial skepticism from people who wanted to spend the money to build projects because the state had a shortage of funds for other programs. "Then we discussed the long-term benefits of Destination Innovation investments and decided to do it," said Sorel. "We wanted to be consistent with what we’re all about as an agency and hold true to our commitment to innovation." The state’s first diverging diamond interchange in St. Cloud. A public-private partnership to improve an interchange at Trunk Highway 169 and Bren Road in Minnetonka. The state did not have the funds to build the interchange alone, so United Health Care Corp. contributed a private sector share. Implementation of project management plans for high-risk and complex projects. "We developed a project management plan template that enhanced our on-time and on-budget project delivery," said Sorel. Traffic management systems for Interstate 94 between Minneapolis and St. Paul. Intelligent transportation systems will monitor each lane, and overhead gantries will help manage traffic. The Minnesota DOT’s Stewardship Council, which is similar to a board of directors, manages the Destination Innovation program. The council consists of the commissioner, the deputy commissioner/chief engineer and six division directors. The agency’s Office of Policy Analysis, Research and Innovation and Office of Capital Programs and Performance Measures support the council in managing Destination Innovation. Because there’s not enough money for all ideas submitted, projects compete for funding. Once employees submit proposals, the Office of Policy Analysis, Research and Innovation reviews each one to determine if it is an innovative approach and how well the project fits with the five strategic directions. The Office of Capital Programs and Performance Measures reviews the proposal for funding eligibility. The proposal then goes to a division champion (typically one of the six division directors) for review. The Stewardship Council makes the final decision on whether to fund the proposal. Installing raised pavement markers, considered one of the most dangerous jobs in highway construction, is now safer because of a Technology Partnerships project to evaluate a new installation system. Reflective pavement markers enhance roadway safety by making it easier for drivers to see lanes at night. In the past, a worker riding on a cantilever seat under a truck, inches from oncoming traffic, installed the markers by hand with hot adhesive. Now the job can be done by an automated pavement marker placement system the driver operates by remote control from the truck cab. Stay Alert Safety Services Inc. of Kernersville, N.C., used a Technology Partnerships grant to develop the system from a prototype into a marketable product and evaluate it on a marker installation project. The evaluation showed that the automated system performed well during its first full-scale operation and offered several advantages over manual methods of marker placement, including improved safety, consistent marker placement and potential cost savings. The Technology Partnerships Program, part of the Highways for LIFE initiative to accelerate use of highway innovations, provides funds to develop and test promising technologies with potential to improve highway quality or safety or cut construction congestion. 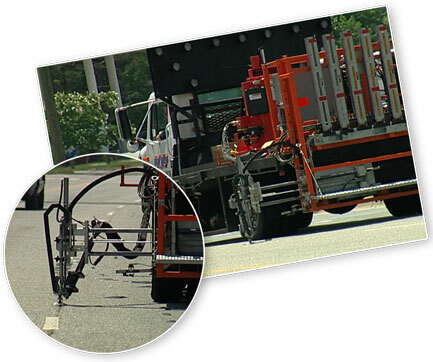 The automated pavement marker placement system, which fits on a flatbed truck, applies bitumen adhesive and drops markers into place with a robotic arm. A computer in the truck cab operates the system, removing workers from direct exposure to traffic and the hot adhesive. In the first phase of the Technology Partnerships project, Stay Alert, working with Detail Technologies Inc., redesigned several of the machine’s subsystems. After conducting a field test, the project team concluded the system design was technically sound and the system was ready for evaluation on a marker installation project. In the project’s second phase, the team made several modifications to the system to improve its reliability and efficiency. Stay Alert used the system in its first full-scale application on a pavement marker installation contract on a four-lane section of U.S. Route 64 in North Carolina. The project team was on hand during the four-day project to evaluate the machine’s performance and troubleshoot any problems. The team made a few adjustments to the system during the installation, but by the end of the project the system was consistently performing well, according to Automated Roadway Pavement Marker Placement System, a Federal Highway Administration report on the project available at www.fhwa.dot.gov/hfl/partnerships/pdfs/auto_roadway_pave.pdf. Increased safety is the most obvious benefit of the system over traditional manual methods of marker placement, the project team concluded, because it eliminates the need for a worker on the marker truck to reach out near live traffic to place the marker and risk being struck by another vehicle. "The system also eliminates the occupational safety concern of workers being severely burned by the 500-degree Fahrenheit bitumen adhesive," the report said. Visual inspection of the marker placements on the Route 64 project showed that the system can install markers as well as or better than the manual method. "The system can adjust the bitumen flow rate to release the same volume of bitumen for each marker," the report said. "Each time, the delivery arm centers the marker in the bitumen and places it with the same downward pressure, ensuring it is at the correct depth in the bitumen." The system also offers potential cost savings through increased production rates. The project team calculated that the automated system can place about 2,100 markers per day on a four-lane highway, which is at the high end of rates for traditional methods. It also eliminates the need for a worker to install markers by hand, enabling the pavement marker contractor to redirect that labor to other tasks. "This is an operation where you have workers with their back to traffic putting down markers," said Chris Howard, signing and delineation standards engineer for the North Carolina Department of Transportation. "We can eliminate an individual from this operation and use their duties somewhere else. By doing that, you’ve automatically increased the safety of this whole operation." For more information on Technology Partnerships, visit www.fhwa.dot.gov/hfl/partnerships, or contact Julie Zirlin at (202) 366-9105 or Julie.Zirlin@dot.gov. For details on the automated pavement marker placement system, contact Jim Babcock at (336) 993-2828 or jbabcock@stayalertsafety.com. To see the system in action, view the video at www.fhwa.dot.gov/hfl/partnerships/safetytech.cfm. 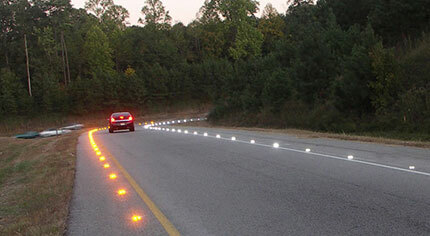 Eight U.S. and international manufacturers are participating in a Technology Partnerships study to document the safety benefits of using light-emitting diode raised pavement markers on horizontal curves to improve guidance to drivers. The study is the latest Technology Partnerships Program effort to evaluate the performance of commercially available highway safety innovations through partnerships with industry and highway agencies. LED raised pavement markers have the potential to improve roadway safety and reduce crashes by increasing the visibility of curves and intersections, especially when darkness or inclement weather makes it hard to see. Although several manufacturers market LED raised pavement markers in the United States, no minimum performance standards have been established and their safety effectiveness has not been clearly demonstrated. LED raised pavement markers, a safety technology undergoing a Technology Partnerships study, are designed to increase the visibility of roadway curves so drivers can navigate them more easily. The LED raised pavement markers are similar to standard reflectorized markers except they have a small LED instead of—or in some cases in addition to—a retroreflective component. The markers have built-in sensors that activate the LED component when ambient lighting falls below a specified threshold. LED markers are powered by solar photocells in each unit, or arrays of the units are hard-wired to a single power source such as a larger solar cell or a signal controller. FHWA is contracting with independent research organizations to conduct the two-part evaluation of the LED markers. The first phase is a laboratory study to measure the optical performance of the markers’ LEDs, as well as the markers’ performance during exposure to extreme temperatures and water. The second phase will be a two-year field study in which LED raised pavement markers will be installed in several states on curves with a history of speeding-related crashes. Crash data collected before and after installation of the LED markers will be compared to document any safety benefits associated with the improved guidance the markers provide. An evaluation report, which will help highway agencies make informed purchasing and installation decisions, will include guidelines on implementing LED markers based on lessons learned during the study. The Federal Highway Administration seeks proposals for a fourth round of grants under the Highways for LIFE Technology Partnerships Program. The focus of the 2012 solicitation is to work with the highway industry to accelerate the adoption of promising innovations that have the potential to reduce crashes or crash severity or that significantly enhance decisionmaking on deploying crash-reduction treatments and understanding of the effectiveness of the treatments. The program is intended to fund proven, late-stage prototypes that require further development and evaluation in a real-world setting before they are ready for the commercial market. Closing dates for the solicitation are January 26 and May 3. Each grant may range from $250,000 to $1 million. To apply, go to http://apply07.grants.gov/apply/opportunities/instructions/oppDTFH61-12-RA-00002-cfda20.200-instructions.pdf. Innovative construction techniques and contracting methods used around the country can improve work zone safety and mobility, transportation professionals learned at a peer exchange workshop sponsored by the Federal Highway Administration. "The objective of this workshop was to bring state DOT practitioners in the operations discipline together with other state DOT practitioners specializing in accelerated bridge and pavement construction, project delivery and performance contracting," Jawad Paracha, FHWA transportation specialist, said about the "Innovative Contracting and Accelerated Construction Techniques for Work Zone Safety and Mobility" workshop in Linthicum, Md. "These strategies can be used, independently or in combination, to improve work zone safety, reduce traffic disruption, possibly lower construction costs and enhance quality." 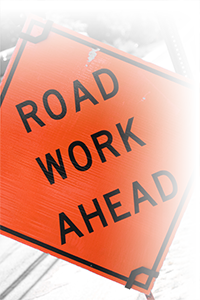 FHWA plans additional workshops in 2012 to provide more opportunities for highway professionals to discuss how accelerated roadwork boosts safety and mobility. At the Maryland event, Jerry Blanding, FHWA innovative contracting engineer, reviewed the design-build and construction management/general contracting, or CMGC, project delivery methods. He explained how the design-build method relies on one contract to achieve both design and construction, typically with multiple subcontracts to carry out the work. Frequently construction starts before design is complete. CMGC is a modified design-build process in which the owner holds the contract for both the design consultant and the contractor, Blanding said. It includes an option to go bid-build at the end of design if the negotiated price is not acceptable to the owner. This puts the owner in charge of project decisions and keeps the cost savings with the owner. The benefits of this process are faster delivery, reduced risk and flexibility. Jagannath Mallela, contract program manager for FHWA’s Highways for LIFE program, offered an overview of accelerated construction techniques for bridges and precast concrete pavement systems for roadways. "Those are just two examples of the accelerated techniques that speed up project delivery and benefit work zone safety and mobility," Mallela said. Neil Boudreau of the Massachusetts Department of Transportation described the "Fast 14" project to replace 14 deteriorated bridge superstructures on Interstate 93 in Medford. The Massachusetts DOT, which received an FHWA Highways for LIFE grant to try innovations on the project, used accelerated bridge construction, prefabricated bridge elements and the design-build delivery method to shrink a four-year project to just one summer. The agency used movable barriers, cross-over lanes, a real-time traffic management system with portable changeable message signs and speed sensors, emergency access points, a mobile command center, and an extensive outreach campaign to make the project a success. "This project is a great example of how well-designed transportation management plans can support accelerated construction strategies and help minimize work zone safety and mobility impacts," said Paracha. Joshua Sletten of the Utah DOT discussed his state’s nation-leading efforts in accelerated bridge construction. The Utah DOT now requires that ABC be considered for all bridge projects as part of its plan to reduce road user costs. Self-propelled modular transporters typically are used to move bridges, built off-site from precast components, into place over a weekend. States are using innovative construction techniques and contracting methods to improve work zone mobility and safety. Benjamin Tang, bridge preservation program manager for the Oregon DOT, explained a new software tool for comparing accelerated bridge construction options with conventional alternatives. Among the factors the tool considers are indirect costs, such as user delay and exposure. Jonathan den Hertog of the California Department of Transportation covered a software tool called CA4PRS that helps agencies analyze pavement rehabilitation strategies. Factors considered include impact on traffic, contractor access, and production rates and costs. He also discussed the California I-15 project, a Highways for LIFE project that used precast concrete pavement panels installed during weekend road closures to rapidly repair a stretch of deteriorated concrete pavement. The workshop fostered interaction among participants from various parts of transportation departments, said Mallela. "They work hand-in-hand on projects, but often one office is not familiar with how other offices in the agency make decisions," he said. "The workshop sought to give them all more insight into how projects are planned, how alternatives for construction are chosen, and how traffic operations, work zone mobility and safety goals are kept in mind when planning projects and choosing project delivery methods." It’s natural for concrete to crack, but the potential for cracking in bridges and pavements can be minimized by the design, materials selection and construction practices used, experts explained during a Federal Highway Administration web conference. The event, "Control of Concrete Cracking in Bridges and Pavements," was part of the free "Innovation" series sponsored by Highways for LIFE and the National Highway Institute. The web conference was based on Control of Cracking in Concrete: State of the Art, a Transportation Research Board research circular. "Cracks can occur for many reasons, but the key is to control the cracks to assure durability and long-term performance," said Myint Lwin, director of the FHWA Office of Bridge Technology, who moderated the conference with Ben Graybeal, FHWA research engineer. "Concrete cracks just by its nature," said Dr. Mohammad Khan, senior vice president of Professional Services Industries Inc. Mechanical loading, environmental factors and harmful reactions such as freezing and thawing, corrosion of reinforcing steel and sulfate attack can produce tensile stresses in concrete. These stresses can result in cracking, both during construction of a bridge or pavement and over the life of the structure. "Careful structural and materials design can keep cracks to an acceptable level," said Khan. "Keep in mind that cracks caused by one factor can promote cracking by other factors. It’s a domino effect." Moisture is the common ingredient in most cracking related to chemical reactions. "If you can control moisture, you can control a lot of the problems associated with concrete," Khan said. Understanding the causes of cracking is "absolutely critical," he added. "If you understand the causes of cracking in concrete, you can take appropriate measures to control them." Dr. David Darwin, University of Kansas professor, reviewed and cited research on a variety of techniques used to control concrete cracking. "Cracks reduce durability, affect appearance and in some cases may represent a major structural problem," he said. To control cracking during construction, use lower-slump, or stiffer, concrete, use a larger number of smaller reinforcing bars, and thoroughly consolidate, or mechanically vibrate, the concrete, Darwin recommended. To prevent shrinkage cracking while plastic, or fresh, concrete is hardening, use high aggregate content and low water and cement content, cure the concrete well, and use contraction joints in appropriate places. "You want to protect the plastic concrete. Don’t let it dry out, because that gives cracks a place to start," said Darwin. Donald Streeter, materials engineer for the New York State Department of Transportation, also discussed ways to prevent cracking. "Materials can be selected to minimize cracking—both raw materials and the mixture design. Use well-graded aggregates, supplementary cementitious materials and different admixtures to provide workable mixtures with low-shrinkage potential," he said. Pavement cracking can be curtailed with good construction practices, starting with a sound design, Streeter said. "Construction practices, while adhering to national standards, can minimize cracking when properly followed." How rapidly concrete is placed, combined with variables like wind and temperature, can affect cracking. "It’s important to place, finish and cure concrete as quickly as possible to minimize environmental impacts," he said. "Finishing should be completed in a timely manner because concrete that sits exposed to the environment both before or after the finishing machine is subject to cracking." For a recording of the web conference, visit www.fhwa.dot.gov/hfl/resources/#webinar. To read Control of Cracking in Concrete: State of the Art, TRB transportation research circular E-C107, go to http://onlinepubs.trb.org/onlinepubs/circulars/ec107.pdf. An innovation called the diverging diamond interchange promises to reduce traffic congestion, improve safety, and slash construction time and costs for an interstate interchange in suburban Rochester, N.Y. The New York State Department of Transportation received a Highways for LIFE grant to use the innovative design on a $4.93 million interchange reconstruction project at the intersection of Interstate 590 and Winton Road. The closest alternative interchange, a partial cloverleaf, would have cost $6.5 million and taken three construction seasons to build, said Eric Thompson, project engineer for the New York State DOT. 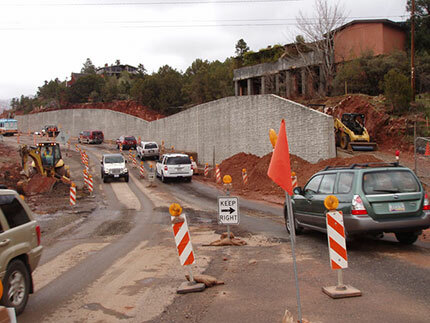 The new DDI will take just two construction seasons to construct. With a DDI, traffic on the non-freeway road briefly drives on the opposite side of the road. Traffic crosses from the right to the left side of the highway at signalized intersections, allowing a free flow of traffic onto the interstate. This configuration eliminates left turns across traffic and minimizes conflict points, resulting in fewer and less severe crashes. The DDI design reduces traffic signal operation to two phases from three or four because the protected left-turn phase is eliminated, said Wei Zhang, intersection/interchange safety program manager in the Federal Highway Administration’s Office of Safety Research and Development. The on- and off-ramp left-turn traffic can move simultaneously with the crossing road through traffic. Those would be conflicting movements with conventional diamond interchange design. The DDI design was conceived and built in France. Since the successful opening of this nation’s first DDI in Springfield, Mo., in 2009, the pace of DDI implementation has exploded, said Zhang. By November 2011, at least seven DDIs had been completed in the United States—three in Missouri, one in Tennessee, two in Utah and one in Kentucky. At least 31 additional DDIs have passed the project selection phase and are in various stages of design and construction. Experience from the Missouri DOT indicates that a DDI costs 60 percent less than a single-point urban interchange that can carry similar traffic flow and takes a third of the time to construct, said Zhang. One year’s crash experience from the first U.S. DDI showed reductions of 24 percent in rear-end crashes and 100 percent in left-turn angle crashes, two of the main crash types on traditional interchanges. FHWA is evaluating the operational and safety performance of six DDIs, Zhang said. A study found that New York’s I-590/Winton Road interchange had congestion and safety problems during peak hours. Another challenge was avoiding a historically significant house in the interchange. The New York State DOT spent two years analyzing solutions, considering additional turn lanes, additional through lanes and different signal timings, as well as a partial cloverleaf and a single-point urban interchange. "We looked at double lefts to get on the interstate and triple lefts to get off it. The cloverleaf was looking good," Thompson recalled. "Then Federal Highways came to us as we were going through the process and asked us to look at a diverging diamond. Would it avoid the historic structure? Yes, it avoided the historic structure, and yes, it provided the capacity improvements we were looking for. And we only had to buy a fraction of the right-of-way for the diverging diamond. So the DDI was less expensive." As for work zone safety, Thompson said the contractor can complete much of the widening work using standard lane closures. But for construction at the cross-over points on either side of the expressway, the contractor will be allowed to close the interchange for up to four entire weekends. "In each weekend they will get 60 hours of work without having traffic in the way, so that will improve work zone safety," said Thompson. Thompson said he understood that total crashes have dropped 60 percent since the Missouri DOT opened the DDI at Springfield. "So if we get anything even close to that we would be extremely pleased," he said. For more information on the I-590/Winton Road project, see www.dot.ny.gov/590winton?nd=nysdot.